Terrifying, unputdownable and full of twists and turns, this stunning thriller will have you on the edge of your seat right to the very end. Wow. Starts off with a bang but becomes a bit long winded at times with 85 chapters. An ordinary couple caught up in extraordinary circumstances. There are a lot of characters in this book but it's a good enough read. A fascinating read! Hard to put down. Many unexpected twists. Really enjoyed the writing style of the author. New parents Harry and Alice, a special effects master and a dental hygienist on maternity leave, are thrown into a dark and twisted world they never expected to entangled in when one night two men break into their house demanding information about a man they've never heard of and threatening the lives of the couple and their 8 week old baby. I was not prepared for the horror of the first chapter...I had palpitations as I read the first dozen pages and I was in a slight state of shock for a little while after!! Thankfully it didn't continue quite in that vein - I'd have been having a heart attack by the end of chapter 3!! Don't get me wrong, the book doesn't slow down that much but it calmed enough for me to catch my breath before the next onslaught of revelations and action. At times it was difficult to know who the good guys are or rather the not-so-bad guys were. The way the story is written, you distrust all and then something happens to make you doubt yourself! When I was asked to "host" the Crimebookjunkie stop on the Tom Bale blog tour, I thought I recognised the name...off to Amazon I toddled and yup, there See How They Run was sat waiting on pre-order. Good start I thought! Then I spotted the publisher was Bookouture, another box got ticked. Since I discovered Bookouture last year when I read Angie Marsons' debut Silent Scream, I have loved every novel I have read that they've published. As well as the aforementioned Ms Marsons' three (soon to be four) crime thrillers (I love Kim Stone), I've loved Caroline Mitchell's DC Jennifer Knight series, the suspense thrillers of Laura Elliot and not forgetting Marcie Steele's books. Tom Bale is now another I can add to the list of the cracking authors Bookouture have signed. But I'll stop with the ode to Bookouture. 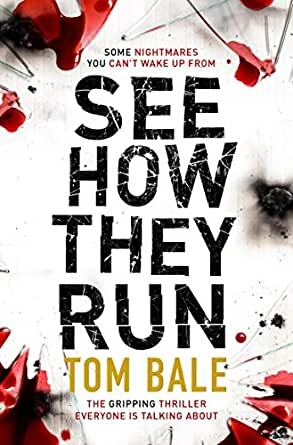 Tom Bale is a brilliant new author (to me anyway) and See How They Run is equally brilliant. Plenty of gasp moments and I was kept guessing and desperate to know how Harry, Alice and Evie were going to get out of their predicament! Massive thanks to Bookouture and Netgalley for giving me a copy of See How They Run I return for my unbiased review! In the middle of the night, Alice and Harry French and their newborn Evie are confronted with their worst nightmare when a couple of intruders show up in their bedroom. The men are wearing plastic covers over their shoes, they are clearly no amateurs and the threat is very real and quite horrific. All they want however is a package addressed to a guy named Renshaw that was delivered to their house. This must be one important package, only they have never heard of Renshaw or have any knowledge about this package. Their terror and innocence seem real enough for the trespassers and they leave empty handed, with the threat they will be watched and there will be repercussions sooner or later if they go to the police. Since nobody was hurt and they don’t have any proof of any kind, they think it best to leave it be, but the next day Harry is contacted by a woman called Ruth and Alice takes a dangerous route herself when she’s trying to find Renshaw, with little Evie in tow. What follows is a nerve-wracking race for Harry to find Alice and Evie, while Alice is on the run for whoever is after Renshaw and the package. They can’t call the police because, as long as Alice can’t be reached, they might think Harry harmed his wife and child. A captivating story that draws you right in and keeps up the suspense throughout the novel. Did you know that the author, Tom Bale, got the inspiration for the novel when he was putting the garbage outside one evening? He heard a sound and started thinking… would any of the neighbours take notice if there was a break-in? Well the situation in this novel is one of those moments we all have when we are laying in our bed and we think we might have heard something. The situation and what follows feels so life-like, you can almost imagine this being the real deal. It makes it all so relatable and I love it when stories start out with ordinary people in ordinary situations that spiral into outrageous ones. This is exactly such a story. There is so much more to say about See How They Run that made me love this novel. I think it really is an added value that the author included a baby in the storyline. He didn’t make it easy on himself because this tiny personality – and Evie is a cool personality even if she’s only 8 weeks old – needs feeding and changing in between and makes travelling, running and all that fairly difficult but he did a beautiful job doing just so without it being ever annoying. Tom Bale also seems to have mastered the knack of developing two separate suspenseful storylines (the one following Harry and the one following his wife Alice) and making them both seem plausible and gripping. It’s not that I wanted to read one of these storylines more than the other, no they were equally engaging with the right amount of tension and cliffhanger each time. Ruth’s character in the book is quite mysterious, making you question if she’s trustworthy and what her deal is in the story for a long time. It takes a while until her story is finally revealed and what her connection to this Laird is. Another twist in the plotline I didn’t imagine and which made me hate Laird even more, although two-faced Nerys and her son came to a close second. If you are talking about bad guys and personalities, he’s done a hell of a job in putting them out there. On the opposite side, Harry and Alice make such a likable family that you would want to help them yourself if you could. This novel was a page-turner and I can highly recommend See How They Run to crime lovers who think they possess nerves of steel. This was an entirely new author to me but I know I definitely want to read more of his work! I thoroughly enjoyed the book from the moment I started it. The authors writing style in this book is one I particularly enjoy and one that is often employed by authors like Dean R. Koontz. And that is the chapters that alternate between the main characters. This book is about an ordinary young family thrown in to very extraordinary circumstances. One chapter will be about the husband searching for his wife and child while being wanted for questioning in their disappearance. The next chapter about the wife as she fights to protect herself and her child. Then a chapter here and there about the various people that are helping them or double crossing them. Because of this, the book moves along very quickly and is full of fast paced action. It's all very refreshing that even though there is plenty of murder and mayhem it is done without being too graphic. I am a fan of psychological thrillers, but this one didn't appeal to me very much. I was expecting a story with twists and turns, but this one didn't really have any. It was filled with action and suspense, but no shocking revelations or surprises. Just people running and hiding and lots of evil, disgusting bad characters. If you are a woman, you may want to read on.....(SPOILER ALERT: There is a particularly disturbing scene of a woman being sexually molested in front of her family and is later stripped bound and almost raped before being rescued and some other severely upsetting scenes of an infant being terrorized-dangled upsidedown by it's pjs, being tossed in the air, knife held to it's throat, kidnapped to be sold). If you are a women or a mother, this may be too disturbing for you. I know it's only fiction, but it can cause anxiety due to the detailed graphic descriptions. I only add this because I wish I had been warned about this content. I wouldn't have read it. 5.0 out of 5 starsAN EDGE OF YOUR SEAT READ!! What a 5 ⭐⭐⭐⭐⭐, exciting read! It's a story about the French family - Harry, Alice and their 8 week old daughter, Evie. What happens next is a story of finding out who Renshaw is and what he's hiding. Alice and Evie encounter Renshaw and are on the run, for fear of being killed. Meanwhile, Harry encounters Ruth, who knows what happened and tries to help Harry find his family. There are so many twists and turns! It's a fast-paced, edge of your seat read! It's a story about a husband searching for his family, in the midst of criminals looking for them. Tom has written a fantastic story! His attention to detail is spot-on! As you read, you can imagine in your mind being there. I am a fan of Tom's books and he didn't disappoint!! I look forward to reading more books from this amazing author! !